In Verse 63 we find a further accentuation of the ambiguous ambivalence implied in the shyness of the previous verse. 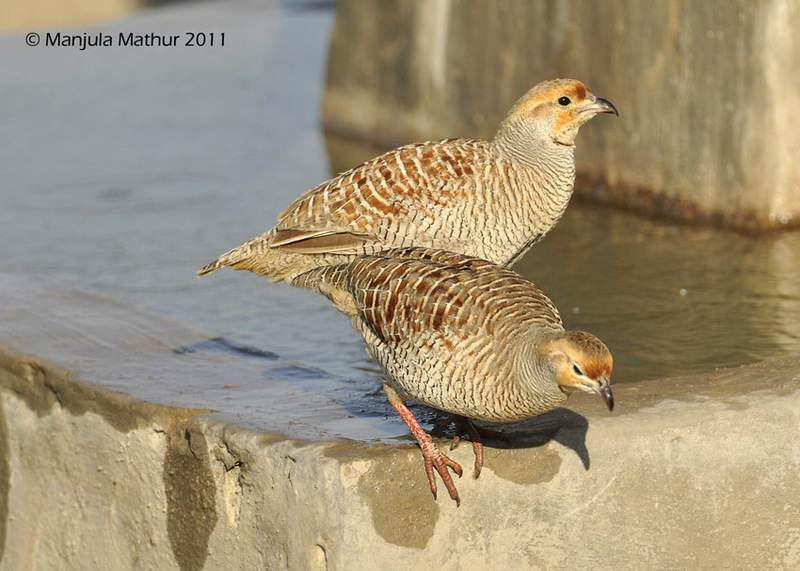 There is a certain variety of partridge common in India known as the chakora, which keeps sleepers awake throughout bright moonlit nights by its repeated noises from trees around homes. Such a partridge is inserted into the context of beauty-appreciation in this verse. There are certain aspects of beauty that can produce surfeit, and there are others that are enjoyable in a different, even negative, sense. Connoisseurs are aware of this difference, as between sweet and dry wines. Moonbeams as a numerator value have to be compensated by the taste of the same moon­beams as understood from the inside of a partridge suffering from surfeit. At the beginning of the night, the partridges indulge in the positive aspect of sweetness and when they are fed up with such sweetness, their power of enjoyment becomes numbed. Their taste is reversed, and they begin to prefer the negative aspect of the same taste. If the Absolute is enjoyable, it is not so in a dull mechanistic sense. The ambivalent aspects of enjoyment have to enter into an alternating interplay, even in the joy of the contemplation of beauty. It is in this sense that tragedies can be entertaining, and that we pay to see films that make us shed tears throughout. Adversities have their sweet uses. Beauty could be one-sided and insipid in the same way. Kalidasa harps on this in almost every descrip­tion of his heroines, as when he says that the beauty of the lotus is enhanced when it is set amongst moss. Sweet and savoury items have to alternate at good parties for the same reason of numbness of tongue referred to in this verse. The main point is contained in the last line, which says that it is the chakora's attitude of mind that removes the numbness or contributes to it, whatever the numerator value in itself might contain by way of sweetness or sourness. It is an alterna­tion established between the sweet and sour tastes playing between overt and innate factors in a figure-eight movement which alone can secure a happiness that can endure through day or night, or early and later moonlight tastes, both of which tend to alternate trans-subjectively and inter-physically. We note from the first line that we are still at the locus of the teeth of the Goddess, when they are revealed to view by her sweet smile. If the moon has a sweet brightness, the teeth add to the sweetness as an attribute to the totality of the face. The moon's orb can be sweet, but the smile makes it more specifically or qualitatively sweet. To both these sweetnesses, which coexist on the positive side of the total situation which we could call absolute Beauty, we have to insert a negative aspect of the same beauty in subjective terms before we could integrate the value of beauty as a totality in which opposites coexist. This requirement is accomplished in the last half of the verse. When put together by abstraction and generalization, absolute Beauty can emerge into view and enter into our own consciousness at one and the same time. Relative or partial beauty thus becomes raised to the status of Absolute Beauty by the cancellation of its own positive and negative sides. Surfeit is supposed to be reached at a certain time of night, whether subjective or objective, where moonlight could be partial or complete. Compensation works both ways: the mind supplies what is not there; and what is there compensates for what the mind hankers after. Thus we have the same constant of Absolute Beauty, though placed within the context of night rather than of daytime. The structural and alternating aspects remain the same, whatever the conjugates involved might be, but the conjugates must belong to the same class, context or order, within a phenomenologically understood epoché or situation. The first line suggests a multiplicity of moons within a general moonlight; each bright tooth representing a unit of beauty set within the totality of the beauty of the moon itself. Substance and attribute can belong together, as also unity and multiplicity. One implies many and many can imply one. Parmenides and Zeno know of this kind of dialectics, by which duality is finally abolished through a correct methodology and not just doctrinally, as for example, in monotheism. The eagerness of the last line is meant to balance the surfeit of the second line; they cancel out into a middle state when the equation is understood. It is not the fault of the Absolute that there is an alternating figure-8 in the Apara Brahman (non-transcendental Absolute). The Absolute constantly emanates the same ambrosial nectar. Only the subjective Self perceives it as alternating between sweet and sour: in this verse the Chakora bird represents this subjective self. "Moonbeam cluster": there is a "bunch" of moonbeams, just as there is a bunch of grapes - they are both something sweet. By trying to enjoy the bright daylight beauty - the overt radiance - each tooth of the Devi is a brightness, a beauty. The bird is enjoying the bright beauty of the teeth and suddenly has satiation of the tip of the tongue, which becomes numb or tired. It continues to drink, but the task is no longer a sweet one. This is something like rice pudding that has been left all night and gone sour. The world over, there are two tastes: sauerkraut and sweet things - dry and bitter as opposed to sweet. In the heart of reality, there are good and bad together. The birds must drink from both of them. The partridges have had too much sweetness of numerator moonlight. On the denominator side is a more "shaded" moonlight, which is like a sour brew. Inside the bird, the colours change as she changes from sweet to sour; consciousness is changing, the same interest cannot be sustained, some alternation is necessary. Narayana Guru: every pleasure in this world is due to alternation. You cannot go to the prostitute every night, it requires correct phasing: allow for the figure-8 operating between the two sides: do not break your nervous system by one-sidedness. (NOTE: In the diagram below, the original manuscript has "SUN" at the top of the vertical axis. As there is no sun in the text and the sun is only incidentally mentioned in the Guru's commentary, we suggest that, maybe, "MOON" should be put in its place, which perhaps fits in better with the original text and commentary. ED).